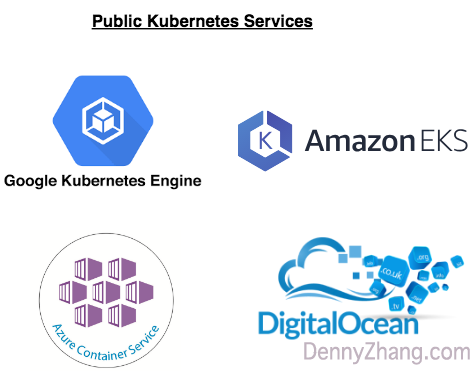 Apparently Google GKE in the leading role of public kubernetes market. And several key competitors like Amazon EKS, Azure AKS, Digitalocean DKS, or others(you name it). Which one to choose for my project, if I want to host my workload as containers in public cloud? The good news is most competitors are providing or will provide similar features like GKE. So they will look more and more similar. That’s why people call it cloud native. But they may not be the same. Two reasons. It takes time to match up. Besides different player may have different strategies. This would make the game even more interesting! Comparing to on-prem envs, running in public cloud is different by nature. There are things we need to be aware up-front. Here are considerations I will seriously look into. The platform maintain the availablity of k8s master nodes. As customers, we don’t pay for master nodes. We trigger master nodes upgrade. Or we can even downgrade for minor versions. We trigger worker nodes upgrade with the batch of node pools. Some kubernetes services may don’t expose this flexiblity to you. The platform does the upgrade with their schedule. From version to version, kubernetes upstream may have breaking changes. Automatic bumping either k8s master version or worker version may not be a good idea, if you want to maintain SLA for your applications. Maintainance or changes of platform happens in your bussiness hours could be harmful, generally speaking. 1.3 Performance for key operations? How fast it takes to create a pod? A loadbalancer service? A Volume? And how fast it takes to delete a service? A namespace? Anti-affinity can be applied to both VM and rack level. Kubernetes services for different regions or different zones? Why it matters? Thus we can avoid SPOF for not only VMs and racks. Different AZs would be good enough to acheive different racks deployment. What if my worker VMs go down or being hijacked somehow? 1.6 What scale my deployment would grow? 1.7 How much it cost? Usually computing resource, loadbalancing and network traffic are main factors for our cloud bills. Use spot instance to save cost? How big the footprint is? 300MB from GKE worker vms. Docker image security: image sign & image scan. Network security, instead of carefully manipulating iptables.